USES: This medication is a combination of omeprazole and sodium bicarbonate. It is used to treat certain stomach and esophagus problems (such as acid reflux, ulcers). It is also used to prevent stomach bleeding in very ill patients. Omeprazole works by decreasing the amount of acid your stomach makes. It belongs to a class of drugs known as proton pump inhibitors (PPIs). Sodium bicarbonate is an antacid that reduces stomach acid and helps omeprazole to work better. This medication relieves symptoms such as heartburn, difficulty swallowing, and persistent cough. It helps heal acid damage to the stomach and esophagus, helps prevent ulcers, and may help prevent cancer of the esophagus. 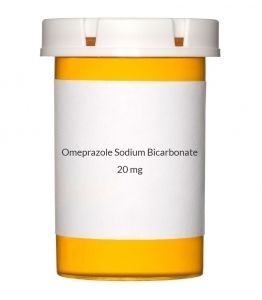 If you are self-treating with this medication, over-the-counter omeprazole/sodium bicarbonate products are used to treat frequent heartburn (occurring 2 or more days a week). Since it may take 1 to 4 days to have full effect, these products do not relieve heartburn right away. For over-the-counter products, carefully read the package instructions to make sure the product is right for you. Check the ingredients on the label even if you have used the product before. The manufacturer may have changed the ingredients. Also, products with similar brand names may contain different ingredients meant for different purposes. Taking the wrong product could harm you. HOW TO USE: Take this medication by mouth as directed by your doctor, usually once daily on an empty stomach, at least 1 hour before a meal. The powder form of this medication may also be given through a tube into the stomach (nasogastric or gastric tube). If you are self-treating, follow all directions on the product package. Dosage and length of treatment are based on your medical condition and response to treatment. Do not increase your dose or take this drug more often than directed. If you have any questions, ask your doctor or pharmacist. If you are taking the capsule, swallow it whole with a full glass of water (8 ounces or 240 milliliters). Do not use other liquids. Do not open the capsule or sprinkle the contents into food. If you are using the powder packet, empty the contents into a small cup with 1 to 2 tablespoons (15 to 30 milliliters) of water. Do not use any other liquids or foods. Stir well and drink the entire mixture right away. To make sure you take the entire dose, add more water to the cup and drink all of it. If you are giving the powder through a nasogastric or gastric tube, ask your health care professional for detailed instructions on how to properly mix and give it. For patients receiving continuous tube feedings, the tube feeding should be stopped for 3 hours before and 1 hour after giving this medication. Do not substitute the capsules or the powder packets for each other, unless approved by your doctor, because they contain different amounts of sodium bicarbonate. Also, do not substitute one strength of the same dosage form for another strength (such as taking two 20-milligram capsules instead of one 40-milligram capsule). Doing so may give you too much sodium bicarbonate and increase your risk of side effects (such as swelling of the hands/feet). If you are also taking sucralfate, take this medication at least 30 minutes before sucralfate. Use this medication regularly to get the most benefit from it. To help you remember, take it at the same time each day. Continue to take this medication for the prescribed length of treatment even if you are feeling better. If you are self-treating with the over-the-counter product, do not take it for more than 14 days unless directed by your doctor. Tell your doctor if your condition persists or worsens. If you are self-treating, tell your doctor if your heartburn persists after 14 days or if you need to use this medication more than once every 4 months. If you think you may have a serious medical problem, get medical help right away. SIDE EFFECTS: Headache or abdominal pain may occur. If any of these effects persist or worsen, tell your doctor or pharmacist promptly. If your doctor has directed you to use this product, remember that he or she has judged that the benefit to you is greater than the risk of side effects. Many people using this medication do not have serious side effects. Tell your doctor immediately if any of these unlikely but serious side effects occur: swelling of the hands/feet, symptoms of a low magnesium blood level (such as unusually fast/slow/irregular heartbeat, persistent muscle spasms, seizures), sudden weight gain. When taken with sodium bicarbonate, large doses of calcium from your diet, medications, or supplements can rarely cause a serious problem called milk-alkali syndrome. Ask your doctor or pharmacist about using calcium products safely while you are using this medication. Tell your doctor immediately if any of these rare but serious side effects occur: dizziness, muscle aches/spasms, mental/mood changes (such as confusion, irritability, memory problems), vomiting, weakness, change in the amount of urine. This medication may rarely cause a severe intestinal condition (Clostridium difficile-associated diarrhea) due to a type of bacteria. Do not use anti-diarrhea products or narcotic pain medications if you have any of the following symptoms because these products may make them worse. Tell your doctor right away if you develop: persistent diarrhea, abdominal or stomach pain/cramping, fever, blood/mucus in your stool. A very serious allergic reaction to this drug is rare. However, get medical help right away if you notice any symptoms of a serious allergic reaction, including: rash, itching/swelling (especially of the face/tongue/throat), severe dizziness, trouble breathing. This is not a complete list of possible side effects. If you notice other effects not listed above, contact your doctor or pharmacist. In the US - Call your doctor for medical advice about side effects. You may report side effects to FDA at 1-800-FDA-1088. In Canada - Call your doctor for medical advice about side effects. You may report side effects to Health Canada at 1-866-234-2345. PRECAUTIONS: Before taking omeprazole/sodium bicarbonate, tell your doctor or pharmacist if you are allergic to it; or to similar drugs (such as lansoprazole, pantoprazole); or if you have any other allergies. This product may contain inactive ingredients, which can cause allergic reactions or other problems. Talk to your pharmacist for more details. Before taking this medication, tell your doctor or pharmacist your medical history, especially of: conditions affected by the sodium in this medication (such as congestive heart failure, high blood pressure, swelling/edema), kidney problems (such as Bartter's syndrome, kidney failure), liver disease (such as cirrhosis), low blood calcium or potassium levels, metabolic imbalance (such as acid-base balance problems). This medication contains salt (sodium). Before taking this medication, tell your doctor or pharmacist if you are on a low-salt diet. Some symptoms may actually be signs of a more serious condition. Tell your doctor immediately if you have: heartburn with lightheadedness/sweating/dizziness, chest pain or shoulder pain (especially with trouble breathing, sweating, lightheadedness, pain spreading to arms/jaw/neck/shoulders), unexplained weight loss. In addition, before you self-treat with this medication, tell your doctor if you have any of these signs of a serious condition: trouble/pain swallowing food, bloody vomit, vomit that looks like coffee grounds, bloody/black stools, heartburn for over 3 months, frequent chest pain, frequent wheezing (especially with heartburn), nausea/vomiting, stomach pain. Proton pump inhibitors (such as omeprazole) may increase your risk for bone fractures, especially with longer use, higher doses, and in older adults. Talk with your doctor or pharmacist about ways to prevent bone loss/fracture, such as by taking calcium (such as calcium citrate) and vitamin D supplements. Before having surgery, tell your doctor or dentist about all the products you use (including prescription drugs, nonprescription drugs, and herbal products). During pregnancy, this medication should be used only when clearly needed. Discuss the risks and benefits with your doctor. This medication passes into breast milk. The effects on a nursing infant are unknown. Consult your doctor before breast-feeding. DRUG INTERACTIONS: See also How to Use section. Drug interactions may change how your medications work or increase your risk for serious side effects. This document does not contain all possible drug interactions. Keep a list of all the products you use (including prescription/nonprescription drugs and herbal products) and share it with your doctor and pharmacist. Do not start, stop, or change the dosage of any medicines without your doctor's approval. Some products that may interact with this drug include: cilostazol, clopidogrel, methotrexate (especially high-dose treatment), rifampin, St John's wort, warfarin. Some products need stomach acid so that the body can absorb them properly. Omeprazole/sodium bicarbonate decreases stomach acid, so it may change how well these products work. Some affected products include amphetamines, ampicillin, atazanavir, digoxin, erlotinib, nelfinavir, rilpivirine, certain azole antifungals (itraconazole, ketoconazole, posaconazole), among others. This medication may interfere with certain laboratory tests, possibly causing false test results. Make sure laboratory personnel and all your doctors know you use this drug. OVERDOSE: If overdose is suspected, contact a poison control center or emergency room immediately. US residents can call the US National Poison Hotline at 1-800-222-1222. Canada residents can call a provincial poison control center. Symptoms of overdose may include: confusion, unusual sweating, blurred vision, unusually fast heartbeat, seizures. STORAGE: Store at room temperature away from light and moisture. Do not open the packets until ready to use. Do not store in the bathroom. Keep all medications away from children and pets. Do not flush medications down the toilet or pour them into a drain unless instructed to do so. Properly discard this product when it is expired or no longer needed. Consult your pharmacist or local waste disposal company.